IF you typed in "define: svelte" at Google's search bar then you are the person I'm looking for. Although if you nodded your head in hopeful agreement upon reading the world svelte, because you are among the smarty-pants who knows what the foreign word means, then you still are the person I'm looking for. I confess, I never thought it would be possible but just recently, it was proven so. Svelte + Wellness can be achieved. A stone throw away from the hip and alive-at-night bars and restaurants of Eastwood City is the beauty and wellness center named, conveniently, as Svelte Wellness Center. A quick look at what the beauty mecca offers and I salivate. I can't help but feel a tinge of envy for those who actually live in the same building as Svelte. Those blessed people should find it less difficult to be attractively thin and gracefully slender (svelte, as defined by Google). In fact, when I visited the wellness center with my friend Lilia to try their treatments, I was completely floored by their exclusive and in-house products. 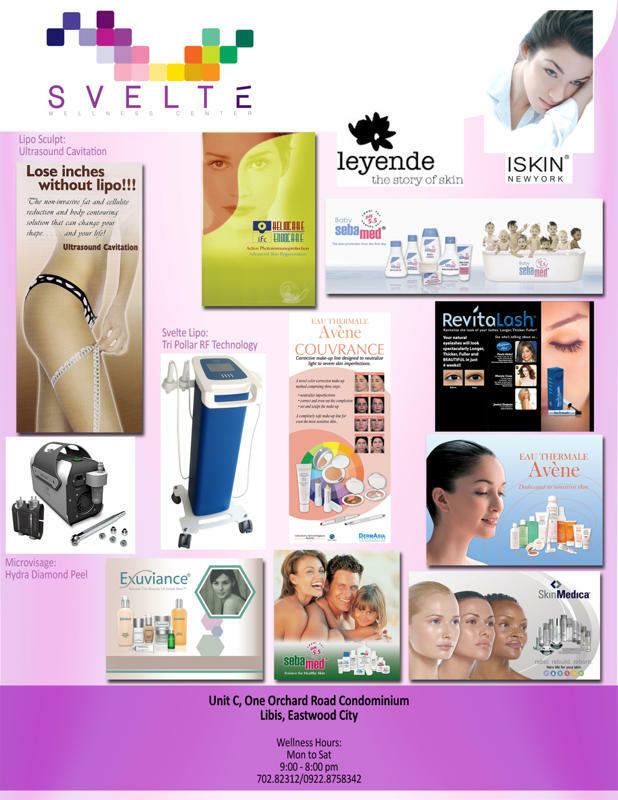 Ms. Kathy of Svelte Wellness Center was orienting me of the wide array of products Svelte carries and mind you, Svelte's wall can possibly give your Dermatologist's consultation fee a run for its money. Among the many products Svelte carries, I was particularly smitten and curiously attracted to the Revitalash. If you're a fan of my Facebook Page you would pretty much know that I am on a lash-trip this season. I have been trying various kinds of mascaras and false lashes. In fact, just so it would be more apparent how much I love lashes, the "comments" of my blogs are called "butterfly kisses", adorable. I haven't tried the Revitalash but it is a product endorsed by different celebrities, both male and female. It is even endorsed by Oprah herself! Now that's reason enough. Other products include the mildest soap alternatives for people with sensitive skin. However, as one dare stare at the wall of wonder at Svelte Wellness Center, how does one ignore those smooth graceful curves mounted on the wall. Ah.. those thighs. Are they even possible? Of course it's a yes! But, really, if you don't have the metabolism of a god when you have the appetite of a Tiger (pun intended! hahaha), how is it possible then to have this (photo below) without breaking a sweat -- for the busy person! Among many, Svelte Wellness Center prides itself of the state-of the-art Ultrasound Cavitation which instantly, yes instantly, lets you lose up to 3 inches in one session! (I sense some brows touching the heavens.) But yes, I wasn't a believer at first, but after hearing the cosmos... I was changed. "Hearing the cosmos..." what do I mean? Well, I could go on and on and tell you of the technicalities of the Ultrasound Lipo BUT since that wouldn't be fun, at all, I'd rather put it the way normal people would say so. In quirky way, it would be as if the unwanted fats and cellulites and god-knows-what would be singing as the ultrasound machine melts them away. As I laid there, with two attendants massaging me with the machine's heads (mimicking mild-to-strong shiatsu massage), I kept on hearing what I could only refer and best describe as the sound of aliens talking (haha, really!). Initially, the weird noise disturbed me BUT after my lovely nurses explained that the louder the noise I hear, the more effectively the machine gets to melt my fats away, I laid there smiling. Listening to the noise "music". After the whole procedure, they'd just wipe-off the ultrasound gel they used and voila, you'd be measured and you'd be inspired to eat again, as I have been! Other than body care, Svelte Wellness Center also offers unique facial treatments that are close if not sure to define the holy grail of facial treatments. 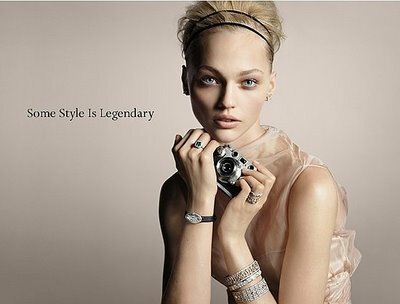 My friend, Lilia described her experience at Svelte to me, in a more than grateful manner. "Svelte Wellness Center surprisingly offers cheap diamond peels--cheap because Svelte makes use of the latest microdermabrasion technology from Israel (photo below)," she said, and since I would love to preserve the blissfulness of her words, I'll share with you verbatim what she has to say regarding Svelte's diamond peel facial treatment. Now, my face is a diamond peel virgin so I have no idea what the procedure will be like. I was briefed by the owner of Svelte that some clinics do diamond peel without incorporating a moisturizing liquid that's why it is sometimes painful for customers and their skin feel dry afterward. Svelte's diamond peel treatment or MicroVisage is different and better because as the skin's dead cells are removed moisturizing liquid is reintroduced to the pores leaving the face soft and smooth. The procedure was quite relaxing. First, the attendant put on a cream to remove make-up residue from my face then a pen-like suction was placed against my skin. From there, the suction began. I have many pimple marks because of the regretful incident with a famous lotion brand I used last December. I asked the attendant to do half of my face first so that I could see the difference. In only a few minutes, the darkest pimple mark that I have lightened up and with that I was simply sold. The MicroVisage procedure only lasted for 15 minutes, but I could immediately see the results since my dark pimple marks have visible lightened. I was very happy and thankful I was able to try their diamond peel service for free. I couldn't stop touching my face afterwards. It really felt like a baby's skin. I can't wait to go back to have another treatment done to have my skin feel pampered again. Face and body bliss? Yes, it is possible under one roof. 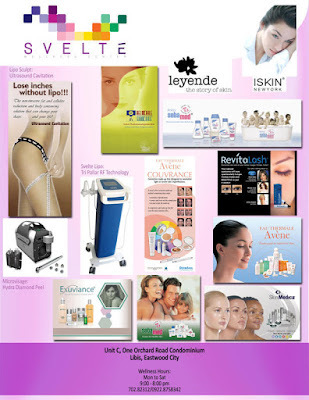 To schedule an appointment or for a free consultation, call Svelte Wellness Center at 02-7028232 and 09228758342. Seba Med brand was recommended to me by my dermatologist. I found it in Watson's Taipei too bad you can't find one over the counter here.